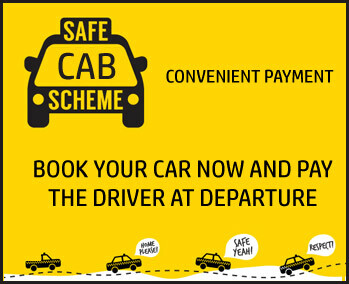 Cabsforyou.com in collaboration with Innoviti/EBS is happy to introduce a facility to convert your cab hire purchase to be paid in Equated Monthly Instalment (EMI) for a period ranging from 03 to 24months depending on the applicable bank credit card. You can now choose to book a cab online for a minimum purchase of INR 2,500 and convert this purchase into EMI as per your requirements. Please find below the terms and conditions governing Credit Card EMI transactions for your reference. Cabsforyou.com and Innoviti/EBS facilitates Equated Monthly Instalments ("EMI") payment method on all purchases worth INR 2,500 and above made on Cabsforyou.com website using credit cards displayed on your screen. The EMI facility is not available on purchases made using Debit cards, Net Banking or Cash to Driver payment methods. The EMI facility is being offered by the respective banks to the customer and Cabsforyou.com and Innoviti/EBS is a facilitator and has no role to play in the approval, extension, pricing, modification, pre-closure, closure or any matter incidental thereto pertaining to offering of the EMI facility, which is decided at the sole discretion of the bank. However, Cabsforyou.com and Innoviti/EBS will provide support on raised dispute between banks and customer. The EMI facility being offered by the banks to the customers is governed by the respective terms and conditions of each bank and the customer is advised to approach the bank in case of any complaint, dispute or enquiry about an EMI transaction. Service tax, Education cess and other taxes will be levied by the banks on the charges levied by them for the EMI facility as mandated by applicable laws and regulations. In the case of customer cancellations or return of items purchased on EMI, Cabsforyou.com and Innoviti/EBS will facilitate the refunds for and on behalf of the sellers as per the relevant refund policy. The customer is advised to check with the respective bank offering the EMI how the cancellations or refund will affect the EMI terms and of any pre-closure or interest charges levied on the customer.